Creating scenes comes naturally when you're using products from My Favorite Things with all of our cute stamp sets. And with every scene you're likely to need a sky. Let's look at some fantastic ways for Creating Cool Skies for your cards. Today's video will give you two creative ideas for creating daytime and nighttime skies in your designs. Kimberly shares two inspiring projects originally created by Torico and gives you step-by-step instructions for recreating these techniques. Watch the video below or click here (February 2016 Release Class - Daytime Sky, Nighttime Sky) to watch it on YouTube. Don't forget to subscribe to our YouTube channel so that you don't miss a single tutorial! That video was seriously inspiring! So many layers and inky goodness, you'll be playing for days. This is just one of five videos in our February Release Class Playlist. Check out the other four HERE. Let's take a look at a few examples of other delightful ways to create cool skies for your scenes. 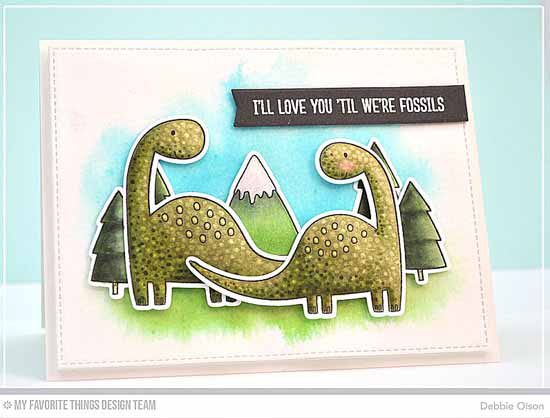 Debbie keeps it simple with her sky with a few dabs of watercolor to highlight the friendly guys from the Prehistoric Fun stamp set and Die-namics. Sometimes just the suggestion of sky is all you need to complete your design. Barbara's nighttime sky was created by dabbing various colors of dye inks on a Sweet Tooth card stock panel and then splatting it with clean water. The stars were created using watered down Copic Opaque. 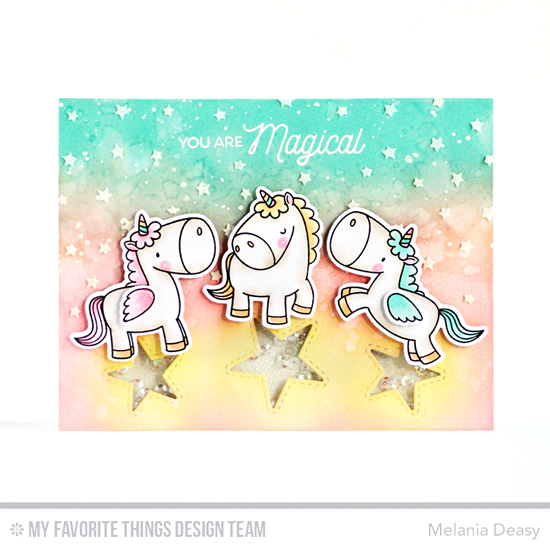 Such a sweet scene with the Snuggle Bunnies stamp set. Who says the sky always has to be blue? Melania creates a magical sky with Lemon Chiffon, Cotton Candy, and Summer Splash Premium Dye Inks. She used the Mini Ink Blending Tool and then splashed it with water. After it dried, she splashed it with white watercolor for this dreamy effect. The stars from the Stars in the Sky - Horizontal Die-namics are the perfect finishing touch! You will LOVE trying these techniques for creating skies. We can't wait to see what you do! Be sure to tag #mftstamps when you post your projects online. We can't wait to see what you've made! Kimberly loved this video, now all I want to do is make skies!